The Chechen city of the dead, a prehistoric sea, shamanist pyramids and other amazing places – just getting to them is an achievement. How to get there: Travelers can only access the volcano by helicopter: the flight from the nearest airport, Yelizovo, takes about one and a half hours. 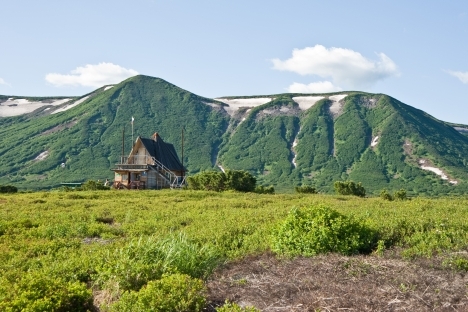 How to get there: Ride the Moscow–Vorkuta train as far as Sindor station, then take the rail car on the Sindor narrow gauge line to the tourist camp at M-222, about 2 miles from the lake. The entire narrow gauge railway workforce is comprised of prisoners, as the line was built for the needs of the corrective labor camp. The line remains under the jurisdiction of the Federal Penitentiary Service. How to get there: Travel from Grozny to the district center Itum-Kali by minibus taxi, then hitch a ride and walk the remainder of the way. Permission from the FSB is required to enter the border zone. How to get there: Travel by car from Biysk to the settlement of Artybash (the road ends several miles ahead of the destination), then take the launch on Lake Teletskoye. Travelers can also depart from Gornoaltaysk: hitch a ride to the main farmstead of the Altai nature preserve in the settlement of Yaylyu, then continue on foot (a guide is necessary). Permission is required to visit the Altai nature preserve. How to get there: Ride the Moscow–Arkhangelsk train (it departs from Yaroslavsky Rail Terminal) as far as Nyandoma station, then take the bus to Kargopol, and another bus from Kargopol to Maselga village. Go the last 10 miles on foot. How to get there: Travelers can get to Taymenye Lake from the lower Multa Lake. Follow the byway for 3–4 days on horseback, and then go on foot for 2–3 days through the passes. The way into the “Averkina Yama” cave is an almost vertical 65-foot gap in the rock, overgrown with forest on the left bank of the River Ay – from the side it is virtually hidden. Inside the cave there are two grottoes, 33 and 66 square miles in area, and an underground lake, which contains potable water and remains at above-zero temperatures year-round. As late as the 1920s, the inhabitants of the cave were known to the local residents under the collective name of the “Averky.” There is also a widespread belief that this is where the gold amassed by Yemelyan Pugachev is hidden. Pugachev was one of the most famous pretenders to the throne of Russia and leader in the Peasants’ War at the end of the 18th century. Annual expeditions to the cave have invariably found troughs hewn from wood in the Averkina Yama – the remains of an ancient pipeline, the purpose of which remains unknown to this day. Where: Chelyabinsk Region, on the banks of the river Ay. How to get there: Take minibus taxi No. 517 from Chelyabinsk to the small town of Satka, and take the local bus to the hamlet of Aylino from there. Travelers have to make their own way from Aylino. How to get there: Travel by train from Murmansk or Arkhangelsk to Unezhma station, and then go by foot. Alternatively, travel by sea from the neighboring village of Nyukhchi or Maloshuiki, if anyone local is willing to take travelers by boat. The permafrost, which happens to push foreign bodies to the surface, allowed for the discovery of the paleo-Asiatic cultures that replaced each other in this region for three millennia. Today, the only reminders of the capital of the last of these cultures – the Eskimo – are whale bones jutting out of the coastal grass and numerous bone artifacts of unknown age and purpose. How to get there: Take the Moscow–Anadyr flight, travel to Lavrenty village on a regular flight with Chukotavia, and then fly on to Uelen settlement (flights depend on the weather). Travelers can also take the ferry that operates on the Bering Strait, June through August. Besides roads, the monastery still lacks electricity and telecommunications. Nevertheless, every year the monastery welcomes dozens of pilgrims, many of whom stay here for the rest of their life. The head of the Kozheozersky monastery, Father Mikhei (Micah), was born in Sergiyev Posad. He is a conductor by trade. He graduated from the Moscow Sveshnikov State Choir School and sang in the Holy Synod choir that was created under the Moscow Patriarchate in 1986. How to get there: Travel by train from Onega to Nimenga station, hitch a ride to the start of the forest track, and walk down the track for about 20 miles to reach Kozhozero. How to get there: Travel by bus from Irkutsk to the “Zama” tourist camp, then go by foot to Onguryona village (hitch-hiking is possible, but there is no regular transport service). Travelers can also get to Cape Yelokhin via “Kometa” motor vessel (running on the Irkutsk–Nizhneangarsk route) and walk from there. Rudolf Island, completely covered in ice, is the northernmost island in Franz Josef Land and the northernmost point in the Russian Arctic. It was discovered in 1874 by the Austrian Tegethof expedition on the way to the North Pole. This small island, 186 square miles in area, is called “the Russian Arctic in miniature.” One of the first Soviet, polar meteorological stations was opened in the summer of 1932, in Teplits Bay on Rudolf Island, just 560 miles from the North Pole. Airfields for flights to the North Pole and to the continent were built 2.5 miles away on an ice dome. In 1995, the station was finally decommissioned. Where: In the north of Franz Josef Land, in Primorsky district, Arkhangelsk Region. How to get there: Travelers can only get here by sea in organized groups, via tourist firms in Arkhangelsk.